2 cryovials of cells per each clone, mycoplasma-free and 90% viability. 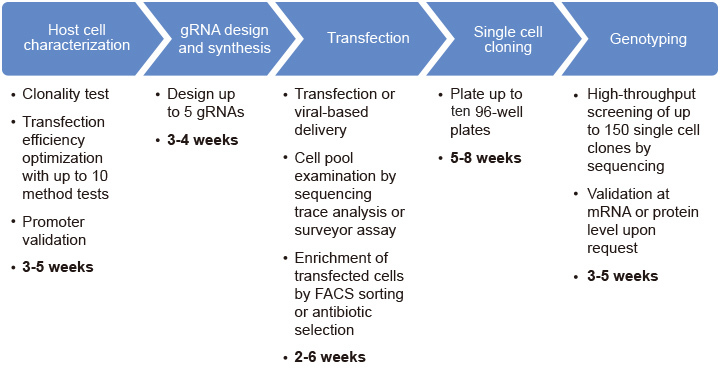 Lentiviral based for difficult-to-transfect cell lines. *It is preferred that customers provide their own cell lines, but cell lines can also be purchased by GenScript for an additional fee. ***Validation services for knock-out cell lines can be found under the "Add On Services" tab. Easy-to-handle and difficult-to-handle cell lines are categorized based on their transfection ability. As compared to Easy-to-handle cell lines, difficult-to-handle cell lines need additional characterization methods including but not limited to: transfection optimization, promoter activity testing, clonality optimization, cell culture establishment, etc.